Following a multi-city roadshow in India for the second consecutive year and the launch of a training course to provide solid education to emerging destinations, European Cities Marketing (ECM) targets emerging countries to promote European destinations and spread its renowned experience. ECM, the European network of city tourist offices and convention bureaus, went through a series of marketing activities in three cities this July: Delhi, Mumbai and Ahmadabad to explore the Indian outbound conference, meetings and incentives market. The ECM Benchmarking report 2014 from ECM indicates that European cities achieved an average relative increase of 3.5% in total bednights and 5% in international bednights. “BRIC markets and in particular India, are important source markets for European cities. The Indian economy is strong and never really felt the impact of the global economic crisis as we did in Europe. There is a huge middle class segment emerging together with a significant high net worth as well as a luxury segment. There is also a lot of interest in travel to Europe. Our belief and experience indicates that Europe is more attractive as an “idea” than a set of individual countries and that cities are far more interesting than the countries they belong to,” said Ignasi de Delàs, ECM President. Riding on the success of last year with more than 200 clients during the whole week, ECM provided its members cities with a yearly roadshow with three luncheons and social events to brand ECM as a roof organisation for 110 European cities and particularly those who attended the event. The roadshow, called Experiential Planner Business Luncheons 2014,was organised in co-operation with tmf dialogue marketing. It was a creative workshop that relied on a wide range of communication, telemarketing and social media activities to give ECM a complete promotion platform consisting of event buildâ€up and followâ€up. 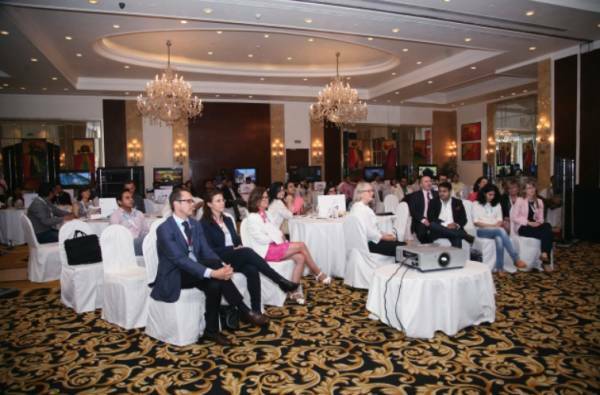 The annual roadshow 2014 took place in Delhi, Mumbai and Ahmadabad, from July 14-17, attended by cities such as Barcelona, Berlin, Bilbao, Salzburg, Vienna and Zagreb, and the interest for the coming years is growing among ECM membership. The innovative part of the collaboration with tmf will also be reflected by a series of workshops dedicated to city’s local partners in Europe. This event helps to e the city’s local partners to be ready for business deals coming from Indian planners and through their convention and visitor bureaus (CVB). “The city’s local partners will learn about opportunities and challenges of a huge market, some cultural aspects reaching into MICE relationships, about groups already handled in Europe and in their city and other key points in doing business with India. The first edition held in Berlin on May 26 was a tremendous success,” said Heike Mahmoud, director of “visitBerlin” Berlin Conventions Office and Vice President for the Meetings Industry at the ECM. In line with the amazing success of the 28th ECM Summer School last August in Genoa, ECM has launched its own Academy as the latest initiative to provide solid education to emerging destinations by encouraging the growth of meetings industry worldwide in non-European continents/regions like Asia, Africa, South America or the Gulf. It is the product derived from the ECM Summer School, the educational landmark in the panorama of the meetings industry in Europe. The ECM Academy is developing future leaders for emerging destinations, being the bridge to a successful career in the Meetings Industry. The tailor-made course is suited for partner organisations outside Europe such as convention bureaux, hotels, PCOs, DMCs, airlines, conference venues, congress centres, convention centres, exhibition centres, and governmental bodies looking towards to a global promotion of the meetings industry. The ECM Academy provides participants the opportunity to meet professional leaders of the meetings industry from Europe as well as developing knowledge and skills for a successful carrier in the industry, while they could recruit and develop a network with new colleagues and future leaders, and more. In line with the ECM Summer School, the programme aims at leading the students towards practical and hands-on education with relevant real case studies and practical situations. It has proved a highly successful concept; the young participants got to familiarise themselves with the fundamentals of our industry with a practical training approach that aims at developing concentration, team-building, interaction in a full immersion course.